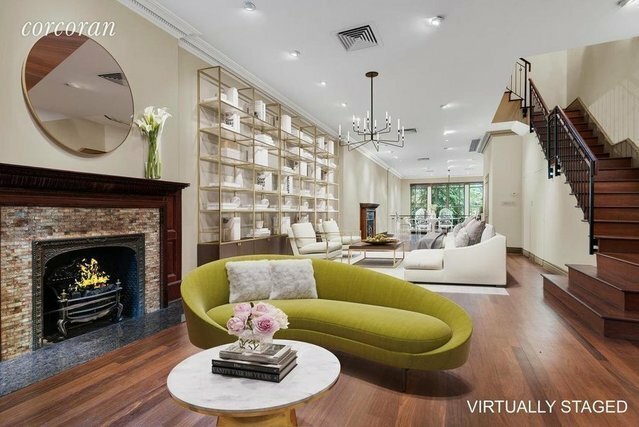 Major Price Adjustment - Bright and airy, this grand 4-story-plus finished basement, fully renovated single-family townhouse combines the scale and elegance of early 20th century architecture with modern comforts and layout. The elegant formal expanse offers generous proportions showcasing the 20' width of the house and its oversized windows on every floor. Light pours in from the double height ceilings and windows on the garden and parlor levels. The house was built circa 1910 and some original details remain while others were custom-designed in the classical tradition preserving the elegance of the era. A full custom renovation 15 years ago added many modern comforts including an elevator that services every floor, central air conditioning, a high-end security system, custom storage and lighting, new mechanicals and a granite-walled wine cellar. The house was designed to accommodate large scale entertaining and optimize space, storage and natural light. Designed by architect, Mark Mariscal and interior designer, Kathy Marr.The impressive scale of the house is enhanced by its high ceilings, beautiful garden and tree-lined block views as well as fantastic light streaming in throughout the day. Abundant outdoor space includes a beautiful 35' landscaped garden fully outfitted with electricity, gas and sprinkler system, a Juliet balcony off the master bedroom and large terrace on the 4th floor. The layout is flexible and can accommodate up to 5 bedrooms, 5 full bathrooms and a 1 powder room. Comprising approximately 5,400 square feet plus a 1,350-finished basement, this beautiful home has been immaculately maintained and is currently configured with a one-bedroom duplex garden floor rental and basement with abundant storage space and wine cellar. The house can easily be returned to single-family state. Original details include two fireplaces (1 wood-burning and 1 gas) with antique mantels, built-in mirror and elegant entrance doors. Designed with additional classically styled details in renovation including hardwood floors, elegant moldings and trim and built-in bookshelves.139 West 78th Street is ideally positioned on a lovely townhouse block just one block from Central Park and a half block from the Museum of Natural History. 78th Street is particularly beautiful earning 'Best Block in NYC' by Time Out magazine and offers a superb and prime Upper West location.